Every once in a while something happens that imparts a feeling of synchronicity, like things fell into place in just the right order and the result was something wonderful. 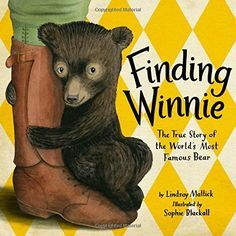 This is the feeling I got after reading Finding Winnie, a picture book written by Lindsay Mattick and illustrated by Sophie Blackall. Finding Winnie is a picture book that manages to celebrate love, friendship, loss, letting go, and starting over in 42 short pages. It is a true story, so the illustrations are very realistic and chronicle Winnie’s journey from Canada to England and eventually to the London Zoo and her chance encounter with a boy named Christopher Robin. The back matter has bonus photographs of of the real Harry and the real Winnie. If you have ever loved a furry friend, this book might make you cry and it will definitely inspire.